I recently discovered the all-star trio band The Winery Dogs featuring Richie Kotzen (gu), Billy Sheehan (b) and Mike Portnoy (dr). These guys need no introduction, they've been around for quite a while, and obviously they're all excellent musicians. So I was very curious to hear them play together and I didn't get disappointed. They have a classic rock trio sound, think Hendrix and Cream with some more modern influences like Lenny Kravitz and Soundgarden. Good songwriting, impeccable playing, and also Kotzen's great soulful voice. When I heard their song Desire, I was surprised by Kotzen's guitar solo. When you hear the song you - or at least I - would expect some typical pentatonic or maybe dorian rock solo, but Richie Kotzen chose to use a lot of chromaticism in a way that I found interesting. So I transcribed his solo and I'll also use it in my lessons. 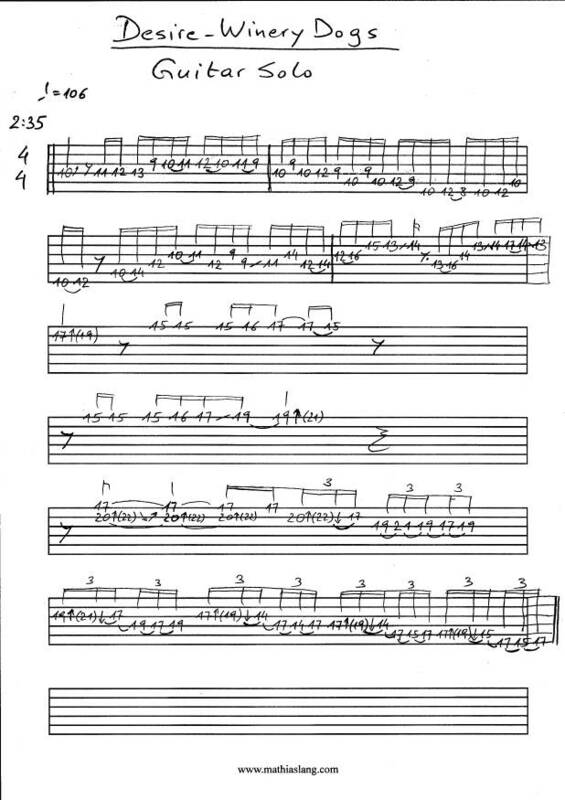 It's only in the last two measures that he shows off some nice pentatonic bending licks played through a wah-pedal. Enjoy! 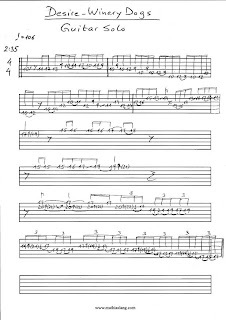 You can find a pdf-version on my TABs and Sheet Music page (scroll down to 'Advanced'). Also check my post on the intro and main riff of the song!